We will meet the SECOND and FOURTH Wednesday evening of each month. (And, we may throw in some special meetings as well...stay tuned!) Sign up for our DIIP News (click the "mailing list" link above and be sure to click "yes" to DIIP) to hear all the latest. DIIP starts at 7pm, come at 6pm if you want to have dinner with us (we go dutch). RSVP acceptance only to Connie@FiberAndFolk.com (Doyle's wants to have an idea of how many to expect). 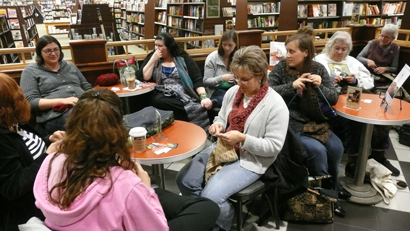 A little “DIIP” history…the concept of “knitting in public” is not a new one, it turns out. In Queen Victoria, Born to Succeed, by Elizabeth Longford, we learn that the Queen, after the death of her husband, Prince Albert, took to knitting because it relieved her stress and distress. Further, she herself wrote about the “royals” that her son “Bertie” ("The King's Speech"--Prince Albert Edward, later King Edward VII) associated with: “The “Marlborough House set” who frequented his London home were the fast set. 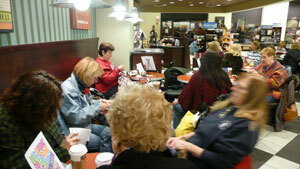 Knitting in public was one of their least offences.” ...We are in ROYAL company! What is “Do It In Public”? It’s our way of supporting our community – the community of fiber artists. In order to be available to more people, we are scattering our meeting times. 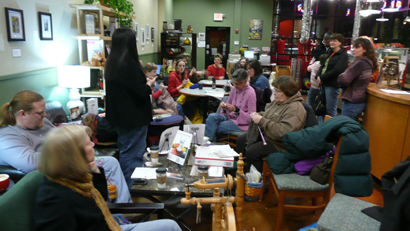 We gather together each month…someplace, and we do our art (whatever it is – lacemaking, knitting, spinning, basket weaving, hand quilting, etc) in a public place. We share with each other and we invite comment from passersby. Everyone is welcome at DIIP! Why do we “Do It In Public”? To promote our passion! We get lots of interest from passersby and we encourage all to be creative! We all encourage and help newbies who come out to join us. Last month, one of our DIIPers finished her first project at a DIIP gathering! To promote our “communities” and provide networking opportunities. We invite guild members to come and talk about their guilds, membership and events – many of those who join us are looking for community. We update you on the Fair – that is the BIG gathering of community! To promote our resources. We invite any local shops to come and talk about their shop – many of us are looking for resources. We need to support our local shops, and more especially in these tough times. We don’t want our precious resources to go away! To promote arts in general. We fiber artists are one of the few kinds of artists who do portable work – so we can "Do It In Public". Those of us who believe that arts belong in our educational systems and add to not only our quality of life but to economic development come to support the arts and arts funding. See fibers and activism below. So, please pass on the word to your communities – guild newsletters, online forums, local yarn shops, etc. about Do It In Public – and encourage them to join us. Come out and have a GREAT time while doing all of the above! Notice: We now have the trademark for "Do It In Public®". We have been holding these meetings since 2008 in association with the event The Midwest Fiber & Folk Art Fair® (MFFAF). The general public may not hold an event or get together called "Do It In Public®". Why? Because it is associated with the MFFAF. We will, however, grant permission to use "Do It In Public®" if you agree to hold it in the spirit of our meetings and to use our signs and format. Please contact carol@fiberandfolk.com if you are interested in holding one of these events/get togethers. Guild Members, – come join us and tell us all about your guild, meetings, etc. We always have someone looking for you. Vendors – come out and talk about your shop, what’s going on, etc. This is a great and warm environment to promote your business, workshops, events, sales, etc. prior to the Fair. Bring your latest fiber project and meet up to discuss all the latest fair news, knitting challenges, crochet, lacemaking, weaving, and quilting patterns. We meet every 2nd and 4th Wednesday evenings—somewhere! Got a great DIIP spot to recommend? E-mail Carol at: Carol@FiberAndFolk.com and we'll get it going! 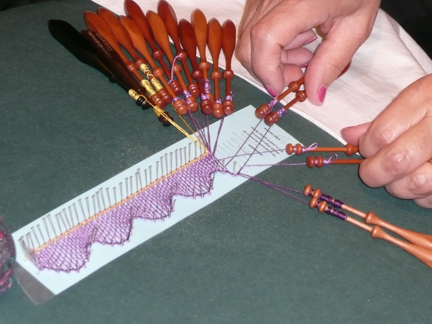 Spinners, crocheters, rug hookers, and lacemakers (even famous ones) are all invited to join us! If you do an art of ANY kind - please join us! PS DIIP'er Janice Blair, shown above, won first place for original design AND popular vote in International Laces, Inc's "Cascade of Lace" competition in 2011 and was the cover girl for "The Bulletin"! Congratulations, Janice! Friendship, coffee and warmth are the themes at DIIP! Fiber arts, fiber art fairs, women, and activism have a long history in the United States. Sayings, including the one above were embroidered into quilts and other household goods and sold at Great Fairs in the North to raise money to support the abolitionists prior to the Civil War. In the South, women sold Gunboat quilts to raise money for the army. Groups like the Woman's Relief Corp that existed right here in Crystal Lake, IL, all got into the prewar effort. Further back in American History, we all remember and learned about the Boston Tea Party, but tea wasn't the only or the first sticking point between the Colonies and the British government. More festering still was the bitter battle over the colony's efforts to begin and sustain textile production. In 1699 the British passed "The Wool Act" which basically prohibited the colonies from selling textiles to anyone but the British government, who in turn sold it back to the colonies. In protest of this act, the ladies of Boston marched out on the Commons and spun yarn in defiance and...in public!! April 19, 2008 53 MILLION Americans are now knitting. Woo Hoo!! knitting, especially those active between the ages of 40 and 60, may help stave off Alzheimer's disease (according to a study presented at the American Academy of Neurology's 52nd Annual Meeting). 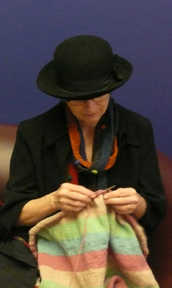 knitting could help alleviate major trauma effects (according to British psychologist Dr. Emily Holmes). knitting and crocheting have been proven to reduce stress according to a study done by Harvard Medical School Mind Body Institute and another study done by University of Toronto? there's even research that suggests that knitting induces a meditative state similar to that of Nepalese monks - who increase the capacity of their brain through meditation. Got a link we should add? Please e-mail Carol@FiberAndFolk.com and we'll add it! "How cool is this?! Thank you!!" "Yours was the best fiber fair that I've ever been to"
"Can't wait for next year :-) "